Xavier never slept in his room. Never played in it. Never watched the sunrise creep in through the window. Never begged another story or asked to keep the light on. He slept in our room for the entire length of his short life. But the room remained his. His things in the drawers. His teddy bear waiting expectantly in the cot. The room was a reflection of our hopes and dreams for our son. I had chosen an airplane theme and decals of paper plans adorned the walls. A paper plane mobile I had made him gently moved in the breeze. Tiny cut out airplanes were attached to his cot. A plush helicopter nestled with cushions on the feeding chair. And in the centre of the main wall, the wooden word “Fly”. “Fly” – those words mocked me for months until in a bout of teary rage I ripped the “F” from the wall. I let “ly” remain – it seemed apt. 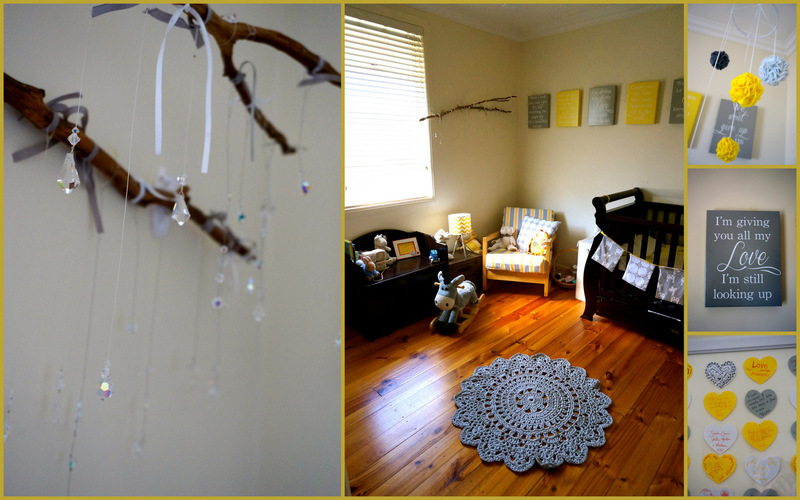 When I was 20 weeks pregnant with Elijah, I started to think about how to re-decorate the nursery. How could this room become another baby’s whilst still honouring Xavier’s memory? How could I take things down and put others in their place without feeling I was erasing and replacing Xavier? I decided that the room could still reflect Xavier – but Xavier as our family experiences him now – his spirit, his presence. Of course, the room holds things that are uniquely Elijah – new toys and clothes. Furniture moved around. A newly upholstered chair and a pretty new rug. But there are many things that reflect Xavier’s love in the room. I chose a sunny yellow and grey theme. I printed the lyrics to “I won’t give up on us” (our song from Xavier) on a series of canvasses that hang above Elijah’s cot, where “Fly” once was. I made bunting with an opening at the back of each flag that allowed friends and family to write wishes and words of hope – a variation of the prayer flags I make for Xavier. More words of welcome were written on hearts and framed. The gifts of words, prayers, and hopes meaning more to me now than teddy bears and nappy cakes. At my Mother Blessing, loved ones hung a crystal each on a branch. That branch hangs in Elijah’s room, refracting Xavier’s sunlight and throwing rainbows around the room. I can imagine Elijah trying to catch them as he gets older. The mobile was made using the instructions here to make the round ruffle balls – Beautiful Nest . I then strung the balls onto an embroidery hoop that I had covered by wrapping ribbon around it. I created the lyric canvases by first creating a document (in Pages, but it would work in Word also) with the text and background colour for each canvas. I then saved this as a PDF, which allowed me to export each page as a separate jpeg image. I used the Kmart photo service to create the canvasses themselves – $19 per faux canvas. I made the bunting, cushion and reupholstered the chair with fabric from Spotlight.